Although CDC studies had ruled out the possibility that a toxin or infectious agent alone directly caused nodding syndrome, Dr. Nath decided to investigate whether infection with a parasitic worm called Onchocerca volvulus might trigger changes in the bodies of these children that set the stage for the disease. O. volvulus is endemic in the Acholi region and causes Onchocerciasis, or river blindness, through the bite of the blackfly. An estimated 25 million people in sub-Saharan Africa are infected O. volvulus. Dr. Nath especially wanted to see if there were particular genetic variations that might make children more susceptible to nodding syndrome if they happened to become infected with O. volvulus. So, following a meeting with Dr. William Gahl, director of the Undiagnosed Diseases Program at NIH, Dr. Nath suggested to the Ugandan Ministry of Health that some of the patients come to NIH for studies that might explain the cause of the disease. The idea made sense, and arrangements were made to select an appropriate family and transport them to NIH’s main campus in Bethesda, MD. 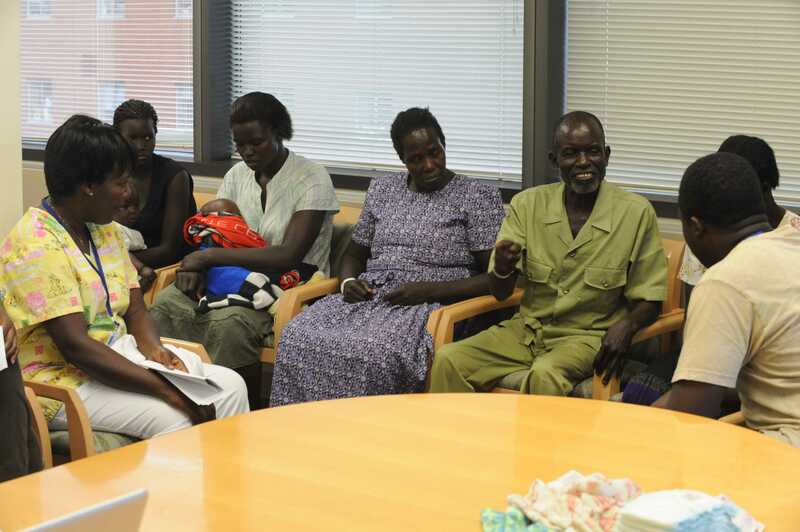 NIH worked with the U.S. Department of State, CDC, and the Ugandan Ministry of Health to fly 10 members of an Acholi family, along with a Ugandan doctor and nurse, who also served as translators, to the United States. It was an enormous accomplishment. Members of this family had never been on a plane, slept in a bed, or owned a pair of shoes. They are used to tribal living; they speak a rare language (even by Ugandan standards), and eat a very different diet than Americans. During their Washington trip, the three affected teenagers stayed at NIH’s Clinical Center, the world’s largest hospital dedicated to clinical research. When not in the hospital for testing, they and their family stayed nearby at The Children’s Inn, which is a private, non-profit home-away-from-home for families and patients participating in biomedical research or receiving treatment at the Clinical Center. The three teenage patients—ages 18, 17, and 13—underwent extensive medical testing, including detailed MRI imaging of their brains and overnight electroencephalography (EEG), which records electrical activity from brainwaves. In addition, all members of the family underwent a range of medical tests. To investigate whether some of the children have genetic variations that make them more vulnerable to disease, Dr. Gahl also plans to sequence and analyze the exomes—the protein-coding part of the genomes—of all three affected children and their unaffected parents. Dr. Nath’s current hypothesis is that antibodies the body generates to fight the O. volvulus worm also recognize a protein in the brain of vulnerable children and trigger the seizures. Thanks to the information collected during the family’s visit, Dr. Nath can now determine whether the data support this hypothesis, or lead to another conclusion. Staff from The Children’s Inn also gave the family a whirlwind tour of the sights in nearby Washington, D.C. Though impressed by the U.S. Capitol, the Washington Monument, and other majestic landmarks, they were equally fascinated by all of the green trees—something not seen in the extremely hot, dry region where they live. And like most modern travelers, they quickly picked up the skill of documenting their activities by taking selfies—in this instance, using their guide’s mobile phone. 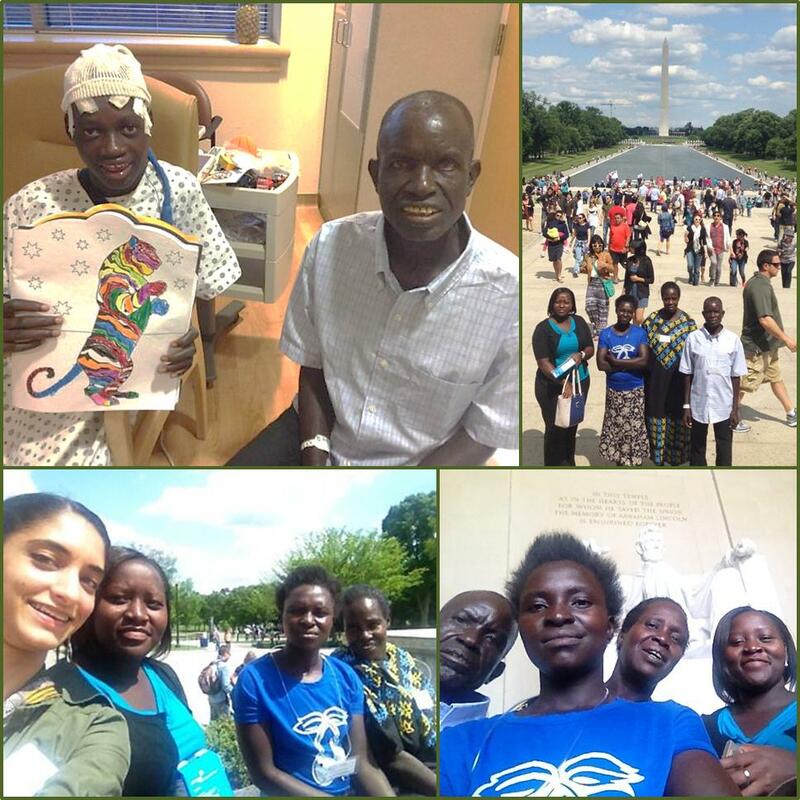 After two weeks of medical tests at the NIH and some memorable cultural experiences, the family flew back to Uganda last week. Dr. Bernard Opar Tolliver, who accompanied the family to the United States and is the coordinator of the nodding syndrome response at the Ugandan Ministry of Health, will remain the liaison between the NIH and the family. Although we’ve collaborated with other countries to bring individuals suffering from rare disorders to NIH, we’ve never brought in so many members of a single family from so remote a region of the world. But the effort is worth it, because studying rare diseases can also lead to profound insights into common diseases. For example, in the U.S. alone, several million people suffer from seizures. Studying nodding syndrome could provide us with new insights about what causes seizures and new approaches to treating them. Collage of images the family provided NIH during their visit—including their selfies. Excellent work. It’s heart warming to see the advances of medical sciences are at least now reaching to the remotest part of the globe – to the people who needs them the most. Initiatives like these must continue for the good of all Humankind.